You know how it is. The road you drive along often is the one you don't look at properly. Whenever I visit Bath I drive into town along London Road, registering various architectural highlights (a Georgian terrace here, a shop front with stained glass there), but not stopping to look properly. 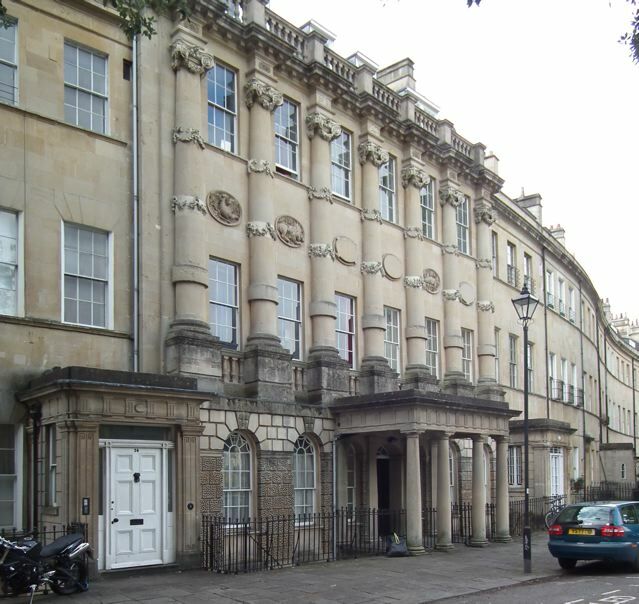 So the other day, encouraged by a picture in Michael Forsyth's Bath in the Pevsner City Guides series, I decided to stop outside Grosvenor Place, one of the terraces that runs alongside London Road, and have a look. I'm glad I did. Architect-builder John Eveleigh started Grosvenor Place in 1791. The idea was to have a swanky central section containing a hotel, with houses on either side. Eveleigh was making a lot of money on speculative building schemes of this kind in Bath, and this site, fronting one of the city's pleasure gardens, seemed like a winner. But in 1793 there was a financial crisis. England and France started a war, the cost of credit rocketed, and Eveleigh, like many of Bath's other builders, found himself in money trouble. He was soon bankrupt, his share in the project was sold, and work on the terrace was halted when it was half done. The project was only completed years later. 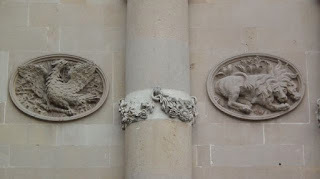 Some of the decoration on the building was never finished – three of the oval panels on the facade, for example, were left uncarved. But even so, the central portion of the terrace is extraordinary. It's an extravaganza with giant columns adorned with garlands (towards the bottom of each column is a plain stone band: presumably this too was meant to be carved into a garland, another job left undone). There are seven columns, a very unclassical odd number which means that the central column is right above the doorway. All very unorthodox and eye-catching. The archetypal fortified dwelling in northern England and the Scottish borders is the tower house. They can take various forms, from small buildings, often called pele towers, that were usually used as refuges and occupied only in times of trouble, to large towers, with lots of rooms and several floors and often turrets at the corners. All these tower houses were built to cope with a tough way of life, in which border territory might change hands and raiders could descend at any moment from either side of the border. You needed thick walls, a good look out, and weapons at the ready. 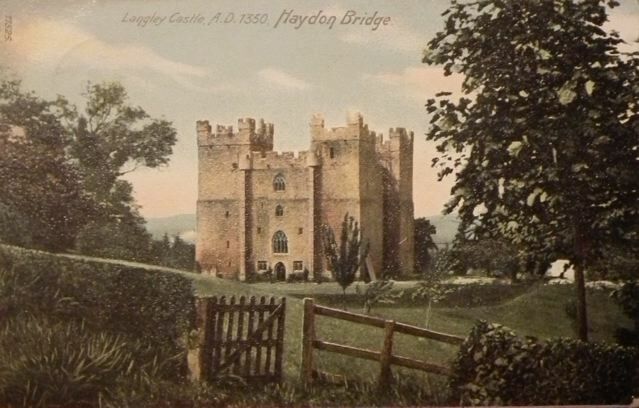 One of the best of these relics of medieval border life is Langley Castle in Northumberland, one of the larger, aristocrat examples of the type, the subject of my postcard this month. 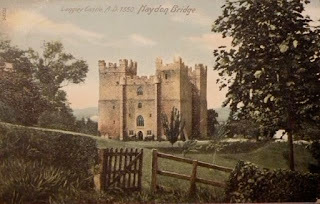 Langley Castle was built in around 1350, probably by Sir Thomas de Lucy. It has a four-storey central block and 5-storey towers. There is an impressive array of windows. Some of the larger ones were added in about 1900, some, mainly the smaller ones, are 14th century. Fireplaces and doorways from the 14th century adorn the interior. The battlements at the top of the building are mostly from the restoration of the late-19th century, a labour of love by a local historian, Cadwallader Bates, and his wife, Josephine. This work was still relatively recent when my postcard was produced – the card was mailed in January 1906.† Since then, the castle has found a new life as a hotel. † My card was sent from Haydon Bridge to Harrogate, to tell someone that "Mr P and Miss H" would arrive at 4.45 pm, an example of the way people in the early-20th century used postcards for short messages, rather as we might send an email today. 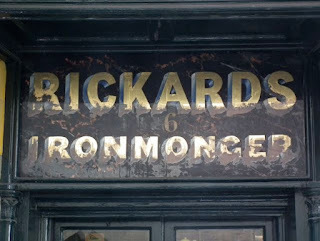 In a recent post I hinted that I would add something more about Rickards, the ironmonger's shop in Ludlow that i visited at the beginning of the month. There has been an ironmonger's business on this site for more than 200 years. In the late-18th century the tenant was Edward Egginton, ironmonger, and there was still an Egginton there in 1861. 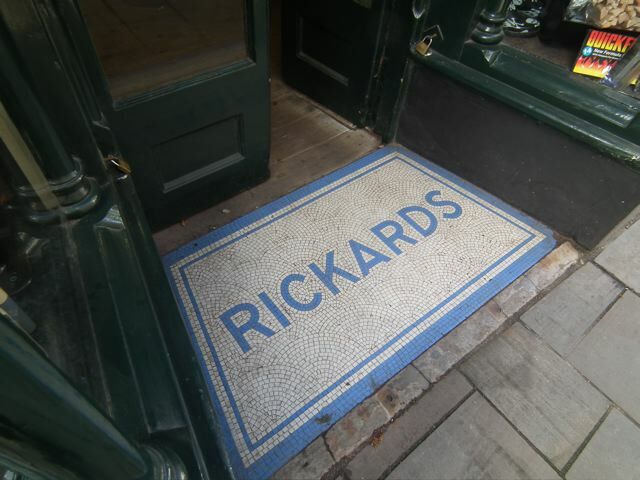 But later in the 1860s, one James Rickards, and soon afterwards his son, Heber Rickards, owned the building. 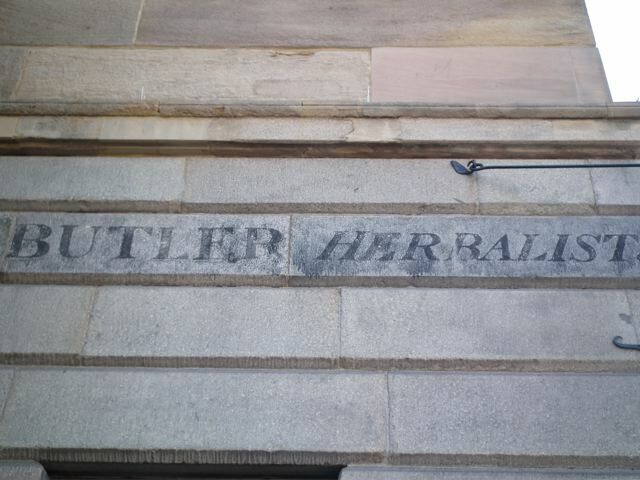 Heber became successful in the business and a prominent citizen of Ludlow, and the business stayed in his family for over 80 years. The premises is a fascinating architectural hotchpotch that bears the imprint of several generations. The two shop fronts, with their narrow glazing bars, look 19th century – the one on the left is probably early-19th century, The gilded lettering over one door may well date from the time of Heber Rickards, while a doorway mosaic may brave been added between the two World Wars. The lettering on the fascia seems to owe something to the Festival of Britain style and I would guess that it dates form the 1950s. As if those details were not riches enough, the interior is a revelation. Rows of wooden draws run along the back walls of both shops. One set of drawers may well date back to the beginning of the 19th century, before the first Rickards took over the business; the other set may date form the time of the Rickards' arrival in the mid-1860s. The array of old advertising posters and cards stuck on these drawers, promoting mothaks, turpentine, and devices to improve your television signal, is a small treasure trove of the history of advertising. 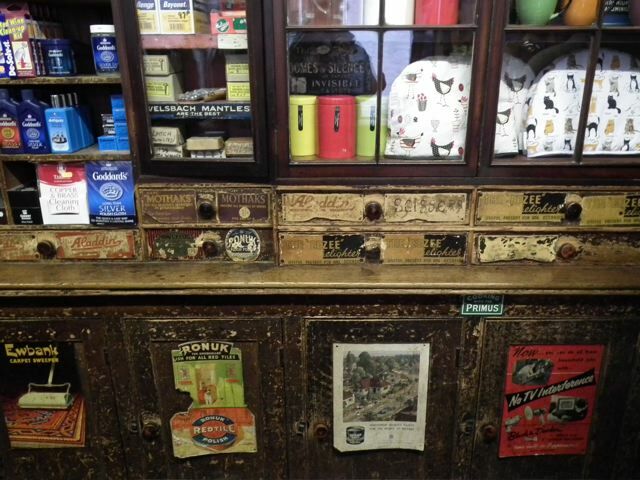 The business's 19th-century cash desk, protected by a tiny sliding glass window, is also intact in the middle of the shop. 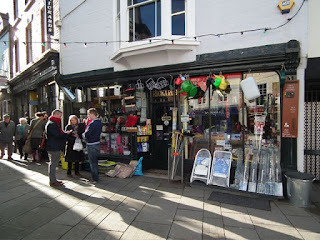 In short, this place is a marvel – both as a monument to the history of the high street and as a living business serving the people of Ludlow and the surrounding area with everything from kettles to balls of string, bars of beeswax to watering cans. If to me the shop represents a rich slice of history, to local people it must be an invaluable resource, a lifeline even. We owe thanks to the people who, through the thick and thin and economic ups and downs, keep it going. 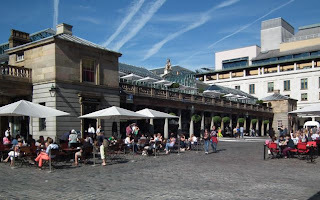 For some years in the 1980s and 1990s I crossed the piazza of Covent Garden every day on my way to and from my desk in the office of a publishing company. Now and then I paused to admire the main market building, the market house designed by Charles Fowler and built in 1828–30, still largely intact but with roofs (glass and slate supported on iron columns) added in the later 19th century. The rows of Tuscan columns and the corner pavilions with their lower storey picked out with banded rustication, defined the outside and are visible in my photograph of the east end of the market house. By the time I began work in this part of London, the market was already beginning its second life as a tourist attraction, the original raison d'être of the place, the wholesale selling of fruit and vegetables, having been moved to a site at Vauxhall. But I'm old enough to remember the vegetable market at Covent Garden with its nocturnal life, its lippy porters, its pubs open in the mornings when this was unknown elsewhere in England, its surrounding labyrinth of lanes and alleys in which opera-goers heading for the "other" Covent Garden would occasionally get lost. I was reminded of all this the other night by a chance online viewing of Lindsay Anderson's documentary Every Day Except Christmas (1957), which chronicles in black and white a day in the life of the market. It is all beautifully shot and composed, from the midnight loading of lorries in Kent, to the organised chaos of the arrival of trucks (apples from the Vale of Evesham, flowers from Lincolnshire, mushrooms from the southeast, and so on) in the crowded streets around the market; from the stallholders' careful arrangement of their stock to their moment of relaxation in a nearby café (this place also inhabited by nocturnal "characters" who seem to have sidled in from another, edgier, world); from the first sale to the removal of vegetables and fruit on precariously loaded barrows and packed vans. Much of what I saw was familiar, from chance late-night crossings of the market years ago and, perhaps, from an earlier viewing of the film itself. But this is where memory starts to play tricks. I hold in my mind a memory of a documentary about the market set to the music of Beethoven's Pathétique sonata, structured around the piece's three movements (fast-slow-fast, mirroring the market's phases of frenetic activity punctuated by an interlude of calm). But there is no such music in Lindsay Anderson's film. Could there have been another documentary covering a day in the life of Covent Garden? Or have I confused Anderson's film with another, on a different subject, but using Beethoven's music? Or have I imagined the whole thing? Googling has not given me an answer. I continue to rack my brains. You step into a field near the church, walk a few yards and watch the parting clouds that shift to let the sun warm up the brickwork. 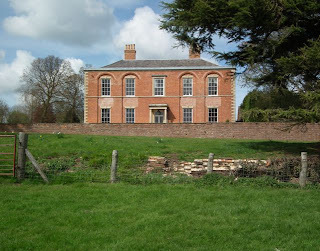 Thanks to a fence, a wall, a ditch, more brickwork, the house keeps you at arm's length and ensures the owners keep their privacy, as they have done, no doubt, since 1792. It's simple really: brick walls, low-pitched roof, a Tuscan porch, four bays of blank arcading, framed by pale quoins and shaded by dark trees. It's likely a replacement for an older house (there's a mullioned window in a cellar somewhere, says Pevsner, giving us the gist; on Medbourne Road, two gate piers, 1700†). I'm thankful for these bits of hidden England.Thanks to the friend who showed this one to me, P. Ashley of Unmitigated England, who posted here about the nearby church. † Please see the comments section for an update. A friend, currently in the antipodes on a round the world trip, is having trouble posting to his Google blog. He gets a repeated error message from Blogger that includes the code bx-g90x6h when he tries to post. I've looked online and it seems that quite a few people are having this problem, but, although some people can get around it by using a different web browser, no one has offered a solution that works for everyone. I am wondering whether any of my readers have encountered this problem and know of a solution. If so, could you leave a message in the comments? My friend is using a recent iPad with the Safari browser. "Built to last" is something people like to say about architecture, and buildings are usually seen as enduring structures. 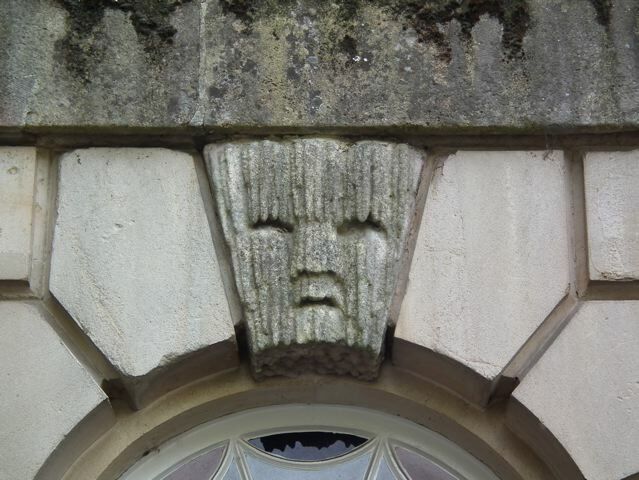 Nearly all the buildings I post about are considerably older than I am, and some of them are 1000 years old or more. But I also like now and then to notice the ephemeral bits and bobs that get attached to buildings. Notices and advertising signs especially: old signs and posters pointing us towards camera film, wagonettes, elastic glue, beer, tea… Most of these weren't meant to be permanent, but somehow they cling on to walls and windows, against all the odds and against ideas that tell us that advertising has to keep up with the times, keep reinventing itself. I saw two more examples at the weekend, stuck to the windows of an ironmonger's shop, Rickard's in Ludlow, a building of which I took many more photographs that I will no doubt share with you eventually. Two stick-on advertisements, one on either side of the shop door, still hanging on, and hanging in. 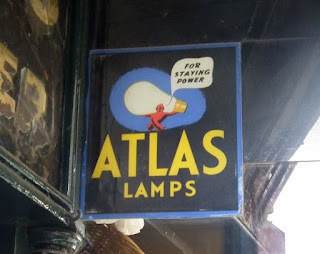 First, a vibrant sign for Atlas Lamps, which caught my eye because it's so colourful. Atlas lamps were in existence by the 1930s – in 1932 or 1933 Jules Thorn, the founder of the Thorn electrical company, started as a lighting manufacturer by buying up the Atlas Works, in Edmonton, London, where Atlas Lamps were produced. 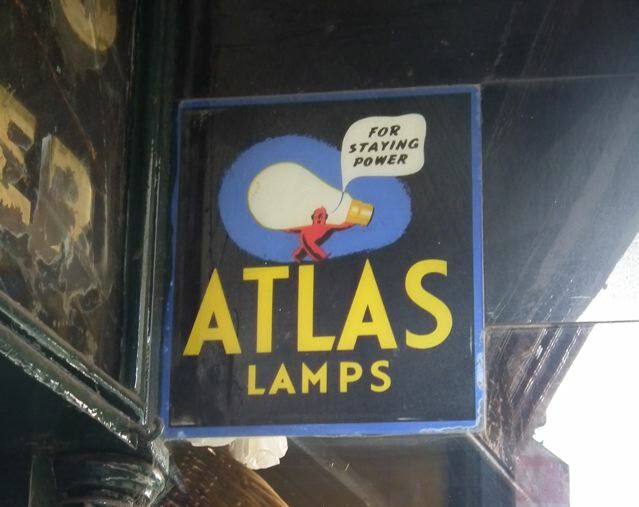 The "For staying power" slogan was in use in the 1940s and 1950s – I've seen it in newspaper advertisements of 1949 and 1950, both using the same distinctive typeface for "ATLAS" that appears on this shop sign. Thorn was still using the Atlas name in the 1960s and 1970s, after which the range was absorbed into the Thorn catalogue. This sign may date from the 1950s, as 1960s Atlas items I've seen online use bold lower-case type for the brand name. Second, a sign for garden tools made by Wilkinson's. 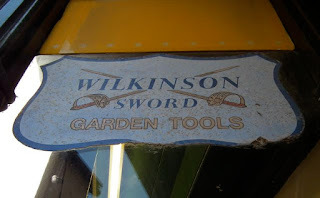 Beginning in the late-18th century as gunmakers, Wilkinson's started producing swords and bayonets in the early-19th century, building up a reputation for producing strong, good quality blades. Diversification into razors (1890) and garden shears (1920) followed. At various points the company produced bicycles, motorcycles, typewriters, and other items too. I've no idea how old this sign is – the style has a late-1950s or early-1960s feel to my eyes, but this is little more than the guesswork of someone trying to cast his mind back many years. And I like the way these signs take the mind back, though my pleasure in them is more than just nostalgic. I'm interested too in the way that artists and designers presented brands in different ways – from the larky drawing of a modern Atlas lifting a light bulb to Wilkinson's more purposeful twin swords. The use of colour is a big contrast too, Atlas's bright, cheerful, appropriately well illuminated, Wilkinson's more subtle, with its mottled background like an old terrazzo floor and its hint of gold. A lot to think about on either side of this shop doorway, before you even step inside. One of the rewarding aspects of maintaining a blog like this is the interesting feedback one receives. Among the responses to the previous post about Monnington on Wye was an email reminding me of the tradition that Owain Glyndwr is buried there and an enquiry about the 19th-century clergyman and diarist Francis Kilvert: didn't Kilvert go to Monnington? He certainly did. Mr. James went with us to the Church which is light and pleasant and cheerful within and seemed well cared for. He told us that in the great flood of February 6, 1852, he and the present Sir Gilbert Lewis of Harpton (then Rector of Monnington) had punted in a flat-bottomed boat across the Court garden, in at the Church door, up the Nave and into the Chancel. Later the same month, Kilvert recalls a Sunday visit, when the three bells are rung and he goes through "the old slanting mouldering lych-gate" to the church. The Rev William Smith preaches the sermon, Thersie plays the harmonium, and Kilvert reads prayers. Even today, Kilvert's descriptions ring true. The place is certainly low-lying and watery: there is a stream nearby, the Wye is not far away, and one can quite believe Kilvert's punting story. 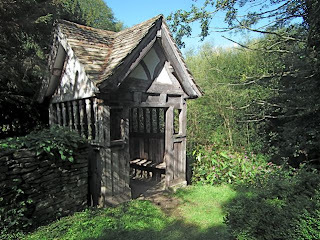 The wooden lychgate – in my photograph above – is still there, but not, I'm pleased to say, slanting or mouldering. Its 17th-century timbers and quadruple gables have been given some loving care since Kilvert's time and it makes a fitting entrance to the churchyard. The church itself is still light and pleasant too, thanks in large part to the clear glass in the windows. The 17th century, when the nave and chancel were built, was not a great age of stained glass, and while one can regret the acres of medieval stained glass that were smashed by iconoclasts elsewhere in England during the Commonwealth period, the clear glass in this building of 1680 works well and is at one with the plain wooden benches and stone-flagged floor. With the door left open on the day I went there, the light pouring in through the windows, and birds singing outside, it couldn't have been that different from when Kilvert visited. † Kilvert's sister was named after her mother. In the account of Josephus, Thermuthis was the name of the Egyptian princess who rescued the infant Moses from the rushes.